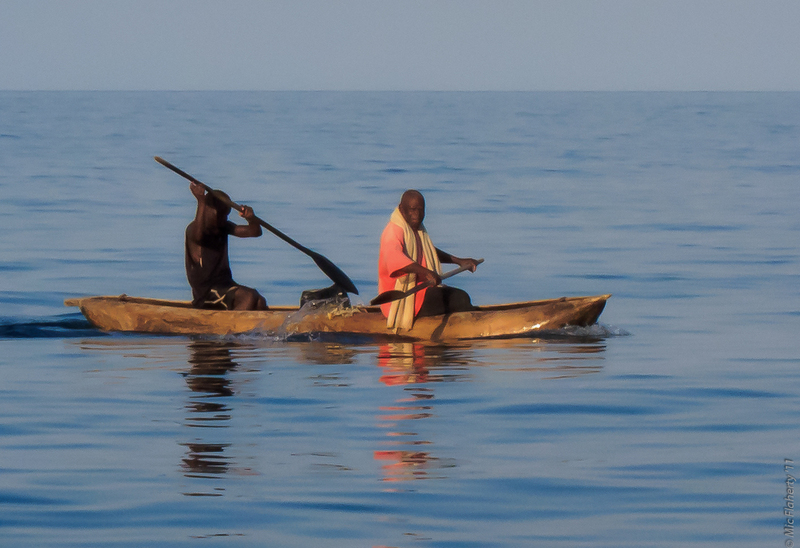 Malawian fishermen ply the coastal waters of the enormous and beautiful Lake Malawi in Africa. Oh Malawi, how I love thee. I traveled to Africa recently, and these are some highlights. Zambia was on the schedule, but after only a week there, I took a left turn and caught a taxi from Chipata, the gateway town for South Luangwa National Park to the Malawian border, crossed on foot, then took a taxi/bus to Lilongwe, the capital. I planned to come back to Zambia on my way back west. Malawi lies at the southern end of the Great Rift Valley, sort of a transition country between Southern and Eastern Africa. It is dominated by one of Africa’s great lakes, in this case Lake Malawi (also called Nyassa), an incredibly clean, pristine, undeveloped, beautiful blue lake. Malawi was one of two countries I visited that were not in the original plan, but the Lonely Planet guidebook I had covered the country along with Zambia. I can highly recommend that guidebook (Zambia & Malawi by Lonely Planet). So I was somewhat prepared. But Malawi is the poorest country I visited, and that is noticeable right away. What I didn’t realize was that Malawians are basically the same people (tribally speaking) as Zambians, and speak a similar language to those in eastern Zambia. They are also as friendly or more so than Zambians. These were the friendliest, happiest people I met in Africa. Add to that it was the cheapest country to visit in the greater southern Africa region, and you have a top-notch “adventure” (hate that word) travel destination. After the capital, I moved on to Lake Malawi, traveling to Nkhata Bay on a long, tortuously crowded bus ride. A fuel shortage was affecting the country at the time of my visit, and boy did it affect travel. After about 12 hours on the bus, I finally got there and was met by a driver from the lodge I stayed at. By the way, bring a tri-band cell phone if you go to Africa, the type that take SIM cards. Then, when you enter a country (even at the border), you can buy a SIM card and charge it up with time. For example, I was able to call several lodges while I was “enjoying” the bus ride and set up a pickup. I REALLY needed that pickup. The Mayoka Village in Nkhata Bay is a backpacker lodge right on the lake. I got a thatch-roofed room with a beautiful bed and a little deck overlooking the lake, all for about $12/night! Within an hour of getting off that bus, I was swimming in the moonlight, the water perfect, my room steps away. Then I visited their lively bar for dinner and conversation, again overlooking the moonlit lake. It was one of those travel experiences you can only get in third world countries: extremely tiring, frustrating travel followed by landing in the lap of perfection! I spent four lovely days at Nkhata Bay. I took walks along country roads, visiting with friendly villagers, shopped the fresh market in town, swam, took boat rides (free!) to nice beaches where we played soccer with locals, hiked along the rocky, beautiful coast (again laughing with locals), snorkeled, ate, drank, and enjoyed perfect summer-type weather. The lake is one of the most beautiful I’ve ever seen. It is so clean you can drink from it with only a little risk, it is very large, with the far shore of Mozambique not even visible in some areas. Importantly, it has no real population of hippos or crocodiles. This makes swimming safe, unlike most places in Africa. Instead, it has a large number of small, colorful fish called Cichlids. These look exactly like aquarium fish because that’s what they are. This is the source for many aquarium fish sold worldwide. The snorkeling is excellent. The image below was taken during one of the free boat rides so graciously provided by one of the guides based at Mayoka Village. A blonde guy from South Africa who looked like he could be straight out of California’s surfing culture, he is a real character, with a surprising number of great stories for someone so young. He took us out in order to promote his guiding business, trying to put out the good word on the backpacker grapevine. There are African fish eagles nesting along the shore which are routinely fed by some boatmen. They pierce a small fish with a floating stick, hold it up and whistle to the bird, then throw the stick in the water for the eagle to come swooping in to take it (image below). This is the only time I got very close to fish eagles, and I didn’t waste the opportunity. I had my point and shoot because we were going to be in the water, wading to shore, swimming, etc. My DSLR would have gotten a higher quality picture, but the Canon S95 (which shoots RAW) did a pretty decent job on the eagle. I can’t recommend Malawi highly enough. And the Lake is a must-see. The north part of the lake, from Nkhata Bay northwards, is less developed in general, but the whole area is pristine and relatively undeveloped for tourism. For example, you can take a light backpack and hike along the coast, village to village, camping near each village or staying with locals, and just soaking up a simpler way of life, not a roadway in sight. In fact, one of these trails starts at Nkhata Bay and enables a 3-4 day walk north, coming back via ferry (if you time it right), hiring a boat, or simply retracing your steps. Another great thing to do if you have time is to hop aboard the weekly ferry over to Likoma Island, where life gets even slower and simpler. With more money and less time you can also take a charter plane to Likoma, which makes sense if you have several people to share the cost. Away from the Lake, there are other sights like the Nyika Plateau. That I’ll save for another post. I now have this dream, where I build an off-grid solar/geothermal house along Lake Malawi, pumping water directly from the lake through a simple filtration system, just enjoying life away from smart phones and traffic. Food you can always get in Africa, but for water and electricity it’s best to be self-sufficient. This is especially true in a country like Malawi. But you could not choose a cheaper, more lovely place along the water to retire. An African fish eagle swoops low over the pristine, blue waters of Lake Malawi.